RAVENOL ARCTIC TRUCK SAE 0W-30 is a special winter oil for use in extreme cold. It is based on a mixture of synthetic polyalphaolefins (PAO) and mineral base oils which remains still liquid at very low temperatures. RAVENOL ARCTIC TRUCK SAE 0W-30 will circulate and pump at temperatures down to minus 40 Deg. C.
RAVENOL ARCTIC TRUCK SAE 0W-30 is recommended for use in diesel engines (incl. turbo) and for 4-stroke gasoline engines for heavy duty work in stationary facilities. 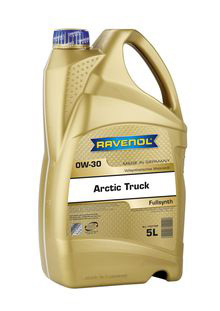 RAVENOL ARCTIC TRUCK SAE 0W-30 is used in all engines and transmission that require oil with specifications. An excellent engine protection even after a cold start and under tougher conditions. Guaranteed at low temperatures down to –40°C a fast lubrication of the motor and a sufficiently thick lubricant film. Protection against silting, carbon deposits, varnish and corrosion even under adverse operating conditions. Guaranteed best wear protection and maximum engine cleanliness. Very stable and excellent viscosity behaviour. Excellent detergent and dispersant properties. Very good wear and corrosion protection, high oxidation stability.